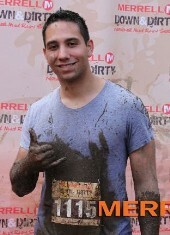 As a result of injuries I was unable to run the last five mud runs I had signed up for this year. Thankfully, I enter September injury free and I plan to run in this upcoming mud run on September 24th in Staten Island, NY at Wolfe’s Pond Park. I’m already registered and ready to go. I’m back training Brazilian Jiu Jitsu and Tae Kwon Do, been able to complete my morning weight training workouts for the last four weeks without missing a day and without any pain. I’m really looking forward to this.